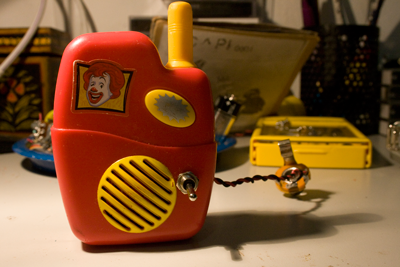 Who doesn’t like an album that mocks McDonald’s with one of their own toys? Throughout the 7-track 20-minute experimental sound album, López displays a musical inclination in the execution of circuit bending as shown in his track, “altamar”. Though I haven’t had a chance to listen to López’ latest work, he has self-released Narita Airport earlier this year. I’ll be giving it a listen and you should probably as well. This entry was posted on	January 19, 2011 at 8:37 am	and is filed under Album Review. I LOVE WELCOME TO MCDONALDS!!!! HAY QUE HACER UNA CANCIÓN UN MIX DE ELECTRO POP! !